Our local city of Sens…interesting by day and stunning by night! Home > Blog > Our local city of Sens, interesting by day and stunning by night! Our local city of Sens, interesting by day and stunning by night! Many of our clients stay in Sens, our local city, before or during their campervan trip. The Cathedral de St Etienne is Sens’ most famous historic building but there is hidden treasure dotted all over the city and you can follow a walking tour to see it all. 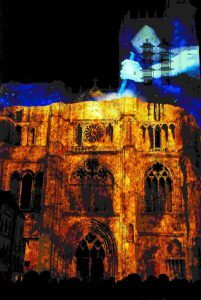 You can explore the cathedral by day, and between mid-June and mid-September you can also see a spectacular, free-of-charge after dark, light show that’s projected on to the façade of the cathedral. 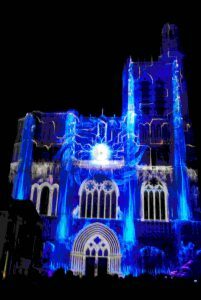 FMH’s Iva took these great photos (below) of the light show last week. Regarded as the first of the great Gothic cathedrals of France, St Etienne’s construction began in 1130. The revolutionary ribbed vault design and subsequent developments such as the flamboyant Gothic transept created a real architectural treasure. You can visit the cathedral any day from 8.00 am to 6.00 pm and take one of the audio tours if you are interested in its history. Pick up a map and/or audio guide (in English) at the Office de Tourisme in Sens. You can choose from an audio tour that focuses solely on the cathedral, or one that takes in all the historical and architectural highlights of Sens. Next to the cathedral is the Museum of Sens, based in the former palace of the Archbishop. It boasts France’s biggest collection of Gallo-Roman finds on the lower level and the treasures of the cathedral on the upper level, where exhibits range from fine paintings to 15th century tapestries. If, like me, you’re a bit of a lazy tourist who takes an unstructured approach, you can explore the city at will and stroll through the cathedral to marvel at the interior then pull up a seat at one of the many bars in the cathedral square and enjoy the view of the façade over a chilled glass of Aligoté white Burgundy (or a warm mug of mulled wine if you are there on a winter’s day). Sens has hotels, restaurants (great if you are arriving in the area too late to collect your motorhome that day), a campsite and a free place for motorhomes to stay overnight right in the middle of the city. 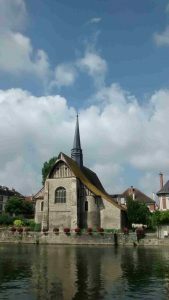 We encourage you to explore any area of France in your campervan, but remember that Burgundy has some of this country’s finest treasures…and they are right on our doorstep! Read about more places you can see and things you can do in France on our ‘Suggested Itineraries‘ page. ← Meet the France Motorhome Hire dream team!